Cooling bandage: ideal for treating wrist, elbow and ankle sprains and injuries. Cooling bandage: designed to treat shoulder, knee, leg and back sprains and injuries. Allows Physicool bandages to be recharged by spraying the coolant directly onto the bandage or spraying the rolled up bandage whilst within the foil packet. This bottle will fully recharge the size A bandage 7 times and the size B bandage 5 times. 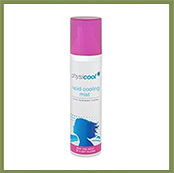 The Cooling Mist offers instant, long-lasting relief from the discomfort of a hot flush or night sweats. Deborah Bruce, Consultant Gynaecologist at London Bridge Hospital and the Council of the British Menopause Society: “The product to cure hot flushes is a Cooling Mist, which contains alcohol that evaporates as soon as it comes into contact with the skin, drawing the heat out immediately. Aloe Vera within the product also helps to alleviate any redness often associated with hot flushes occurring in menopausal women. The cooling mist smells really lovely, I can certainly see this product being very popular for women for whom hormone replacement therapy (HRT) is contraindicated. 9 out of 10 women reported that the Cooling Mist significantly reduced their hot flush symptoms in a recent independent study. Containing a Size A Cooling bandage and 150ml of Coolant the Combination Pack is ideal for treating wrist, elbow and ankle sprains and injuries. Physicool’s reusable cooling bandage combine’s instant cooling, compression and support. Used to reduce swelling and inflammation fast, apply Physicool to combat pain and speed up your recovery. Physicool is a recognised medical treatment and a staple ingredient of every athlete’s and physio’s kit, providing all the benefits of a cooling aid, but without the need for refrigeration. 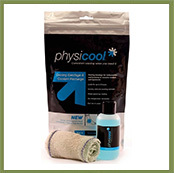 Physicool works by rapid evaporation – drawing heat out of an injury. Because the bandage is fastened to the injured limb, it provides consistent, ergonomic relief, quickly reducing swelling and pain whilst helping speed up healing and recovery time. Each bandage has a Velcro strap that holds it in place without creating a pressure point. Initially charged with 2-3 hours cooling the bandages are reusable and Physicool’s unique cooling effects will still be felt long after removal. Physicool is a perfect solution for all strains, sprains and knocks. Recharge with Physicool Coolant. Swelling/Inflammation Reduction – Physicool has been clinically proven to be very effective in reducing pain and inflammation – allowing people to mobilise quicker, shortening recovery time. Promotes Healing – Physicool allows blood to flow freely around the injured area. 360 Degrees Conformity – When wrapped around an injured area, the bandage provides total coverage and all-round cooling. No need to Refrigerate – The bandages provide instant cooling straight from the packet. There is no need for refrigeration, ice or cold water. Easy to Apply – The bandage can be applied one handed and fastened using the attached Velcro strap. The bandage can be stored anywhere and are of a handy, portable size. Physicool can be used anywhere and at anytime. Constant Use – Each bandage will provide 2 to 3 hours of cooling before drying out. Once dry, reapply with Coolant for continual use. Reusable – The bandages are 100% cotton and washable. 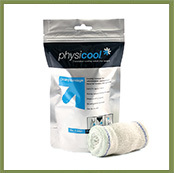 Physicool is a unique cooling bandage system impregnated with rapidly evaporating alcohols. When the bandage is wrapped around a limb or body part, the alcohols will react to the body heat and evaporate. The evaporative process draws heat out of the local underlying tissue. Whilst the deep tissue is cooling down the simultaneous compression will modify the inflammatory response, helping healing and recovery. 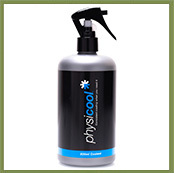 Physicool’s cooling products have been designed and medically tested to deliver the very best in instant cooling therapy. Each bandage comes pre-treated in the medically formulated coolant. Physicool’s reusable cooling bandage combines instant cooling, compression and support. When an injury occurs there is inflammation and pain. Oedema occurs due to an increase in local blood flow to the injured site. The application of Physicool’s cooling bandage reduces the tissue temperature around the injured site resulting in constriction of local blood vessels; therefore reducing blood flow and swelling, treating the injured area. Reducing the amount of swelling early on will reduce the pain as the nerve endings at the injured site will not be as compressed. Physicool is a sports injury treatment and kit- bag essential. Used by sport enthusiasts, athletes, therapists and coaches. It is used to treat acute injuries or systematically used throughout training for recovery. Physicool has become a reliable rehabilitation essential, enabling athletes and sport enthusiasts to recover quicker, train harder and reach peak performance. CUT with scissors above the resealing line where marked. Remove bandage and squeeze excess fluid from bandage until ‘moist’ but not ‘wet’. To conserve some fluid, it can be squeezed back into the original packet. Wrap bandage gently yet firm around the affected body area. Be careful not to overlap by more than a third. If the application of the bandage causes any severe increase in the pain then it must be removed immediately. Keep the end in mind: the Velcro end of the strap should finish off around the thinnest diameter for intended body part. Do NOT wear long pants/ tops over the bandage as it will limit the performance and evaporating affect. Normal rest and elevation of your injury will further assist in the reduction of swelling/pain. Re-spray bandage (up to 35 sprays = 35ml) while keeping it on – ensure that a towel is used to dab away any residual dripping of fluid. Remove bandage, and re-roll (starting with the Velcro end), place back into the packet and apply spray 35ml. The bandage is now ready to use as before. A ‘tingling’ sensation – this is completely normal and indicates that evaporation is taking place. In the first few minutes of application, if you hold your hand 1cm over the bandage (not touching), you will feel warmth radiating from it which is heat being ‘drawn out’ of the area, thus creating cooling internally.